“Gymnema sylvestre” is an herb used in Indian Ayurvedic medicine. The U.S. National Library of Medicine and the National Institutes of Health have both reported that gymnema sylvestre could be helpful in controlling blood sugar levels in people with type 2 diabetes. The herb has some pretty special abilities when it comes to sugar intake. Gymnema sylvestre contains an active ingredient called “gymnemic acid.” Gymnemic acid is extracted from the leaves and roots of the plant. 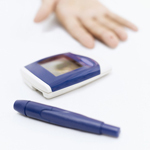 It is this ingredient that could help lower and balance blood sugar levels. How does gymnemic acid do this? It turns out that gymnemic acid molecules have a unique shape that is similar to that of glucose. This allows the molecules to fill cell receptors in the lining of the intestines, which in turn prevents the uptake of sugar molecules. In a study performed at King’s College, London, researchers studied the effects of Gymnema sylvestre on patients with type 2 diabetes. After administering the herb to the patients, the research team recorded that Gymnema sylvestre induced significant increases in circulating insulin, which is associated with a significant reduction in fasting and after-meal blood glucose. The researchers concluded that Gymnema sylvestre may provide a potential alternative therapy for the hyperglycemia (high blood sugar) associated with type 2 diabetes. Gymnema sylvestre could also help curb your cravings for sweets. It is also thought that, when taking the herb with a high-carbohydrate meal or a meal high in sugar, it can make more carbs available for burning. And when these carbs are burned, they can’t be turned into fat stores, helping you to slim down and build more lean muscle mass. Quality Gymnema sylvestre should contain a minimum of 25% of the active ingredient gymnemic acid. A method developed by the Food and Drug Administration called “standardization” indicates how much of the active ingredient is present in herbs. So, a single 500-milligram (mg) capsule standardized to 25% yields 125 mg of active gymnema acid per capsule. Make sure you consider the standardization when figuring out the correct dosage to take. One final note: if you add Gymnema sylvestre to your diet and you are already using insulin or medication to treat diabetes, it is important that you talk to your doctor, as the level of these conventional treatments may need to be reduced once you are taking the herb.